The copper roof sheets were laid upon a bituminous vapour control layer over an insulated Metdeck substrate. A Bailey aluminium soffit system was also installed. The combined effect of the glazing and cladding offers a state of the art visitor centre experience that showcases traditional skill and craftsmanship in a modern design. The copper rainwater goods were bespoke and our craftsmen also added their own unique touch to the roof apex in the form of handcrafted roses also made from copper. 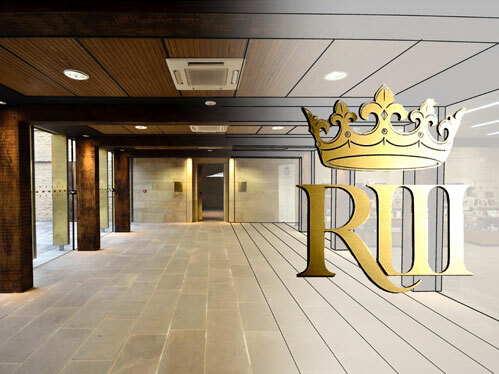 Following the 2012 discovery of the remains of Richard III in a car park in Leicester, as local contractors, Norman and Underwood were immensely proud to secure the copper roofing/cladding and glazing contracts for the Visitor Centre, which opened to the public in 2014. In August 1485 King Richard III was killed at the battle of Bosworth. Coinciding with the 527th anniversary of his death, his bones were discovered on the site of the medieval friary of the Grey Friars. Norman and Underwood Ltd were appointed to fabricate and install Tecu Brass (copper with a brass effect finish) to the roof, fascias, gutters and exterior walls and Proteus engineered façade technology (copper finished aluminium honeycomb panels) to the interior.